The teaser on the right hit the Internet about three hours ago, which means I’ve had about two hours to digest it. I’ve decided, and this goes for all teasers released so far, that I’m going to mentally put them aside, read each issue as it comes out, rate it on its own merits and not pass any judgment on any story until I see it in print. I think both Diggle and Johnston deserve to have their stories read with as few preconceived notions as possible, especially with the Marvel hype machine wreaking havoc in Daredevil’s corner of the Marvel U, not unlike an elephant in a china store. Having said that, what exactly are we looking at here? It could mean the end of the Daredevil identity, the end of Matt Murdock, or simply the end of Shadowland. 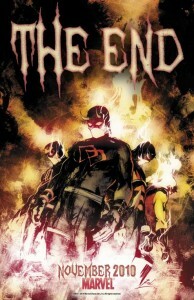 It could also mean that Bendis’s Daredevil: End of Days is finally coming out. We simply don’t know. What I’m sure it doesn’t mean is a permanent end to either Matt Murdock or Daredevil. Marvel seems reluctant to even let the D-listers stay dead for very long, and what kind of business move would it be to give one of their most resilient characters, with a fiercely loyal albeit modest fan base, his own event and a more central role in the Marvel Universe only to remove him from the scene? There is also talk of a new Daredevil movie being made within the next few years. However, I am worried that messing around too much with Daredevil will eventually cause his sales figures to plummet, no matter how good the stories turn out to be. The number of people you run across online who say that Daredevil is the only Marvel title they read – or one of very few – precisely because he’s been spared the hype is pretty big. I really do hope that the people at Marvel realize this. I’m actually one of those readers who is happy to disregard certain chapters of a character’s past. Matt going into space way back in Daredevil #2? Didn’t happen as far as I’m concerned. Matt going to hell during Nocenti’s run? Well, the story does have its merits, but let’s pretend that didn’t happen either. Guardian Devil? Well, Karen is obviously dead, the rest I choose not to think about (no offense to those of you who did enjoy it). If Shadowland and everything that comes after turn out to be great stories that fans can enjoy and Marvel make a nice buck out of, then that’s wonderful. That’s what I’m hoping for. Not knowing even allows me to assume that will be the case, because I’m an optimist. If not, there are certainly bigger issues to care about in life, and I can look back on this story as just one of those stories that didn’t quite sit right with me and not hold it against the character. I just wish, for the sake of this story, and speaking as a someone who’s made quite a hobby of spreading the gospel of Murdock, that everyone involved with this knows what exactly what they’re doing. I choose to trust Diggle and Marvel on this one, but not without some trepidation. I’ll venture to guess that since the eyes are glowing red that it signals the end of Snakeroot’s control of him. Nothing more. Sadly, I don’t recognize the DD costume to the right of the Shadowland costume. Is that supposed to be the armored “Fall From Grace” one? Regardless, I think it’s a pretty picture with absolutely gorgeous coloring. It’s certainly more interesting than any of the “New Man Without Fear” teasers we’ve seen of late. Maybe it just means that it is the end of the costume and Matt Murdock will be running around beating up bad guys, Steve Rogers style. But as to what that entails who knows. Maybe he really will be a villain, and we’ll end up with a Daredemon. I don’t like that as a way to have Matt Murdock defeated though. He was never about having the strongest powers or being the toughest guy around, he was always about being the guy with the strongest will. So they take him out of the picture by having him possessed and turned into a demon. Actually upon closer examination I am even more intrigued. We all know Matt is p.o’ed at the Hand Ninjas for being mediocre cannon fodder. An army of Daredevil look alikes would be… interesting at least. Or it’s the end of his control of the Hand and they’re burning his costumes as an effigy. Everything else aside… I really like the image. I can’t see this being “End of Days” because of the prominence of the Shadowland costume, which leads me to the end of Shadowland (followed by 6 issues of something else, then back to normal… a’la Matt in prison). I guess I was wrong. Apparently, it’s the end of the title (pending re-launch…ugh!). *Furiously shakes fist at Tom Brevoort! A SHADOWLAND TIE-IN: FINAL ISSUE! Years of acting as the Guardian Devil of Hell’s Kitchen have taken their toll on The Man Without Fear. Hell’s Kitchen lies in ruins, and it is up to the people of New York to start anew and begin rebuilding. In this last chapter of his story, will Matt Murdock at last find final redemption for the events of SHADOWLAND?